Have you ever admired a masonry o/r stone walkway or patio? Beautiful outdoor improvements formed from these durable building materials remain popular home selections in today’s North Carolina housing marketplace. Yet some savvy real estate owners save considerable sums of money by selecting low-maintenance stamped concrete as an alternative construction option. Your family members and friends will notice your home’s lovely new landscaping features with approval. You’ll gain enormous satisfaction from receiving their compliments. Yet you’ll also relish the secret pleasure of knowing you’ve chosen one of the most cost-efficient ways possible to install attractive outdoor walks, patios, and picnic areas. Best of all, over the course of time you’ll benefit from significantly reduced annual maintenance responsibilities. Discover all the advantages of requesting stamped concrete today! The complex specialty of concrete stamping has existed for many years. The field first gained widespread popularity in the United States during the 1970s. At that time, a growing number of customers began appreciating how stamped concrete products could resemble a variety of other popular construction materials, including natural stone, slate, brick and tile. Typically, concrete stamping occurs in conjunction with the use of specialized stains and accent colors. Craftsmen preparing these surfaces will pour concrete, add accents, and then use specialized molds to “stamp” in a desired pattern. This decorative process forever changes the texture of the surface. It enables a concrete driveway, walk, or patio to assume the permanent appearance of masonry, cobblestones, or other construction materials. Why do so many customers request the use of stamped concrete? Employing this decorative technique significantly improves the appearance of landscaping features by enabling them to carry forward a unified design theme. For instance, if you reside in a brick residence, you may prefer coordinating walkways and other outdoor residential improvements to match stylish residential masonry. Yet you’ll typically pay significantly less by choosing stamped concrete as a building material. Concrete remains highly affordable. One a per-pound basis, it costs far less than brick, slate, natural stone, ceramic tile, and most other common construction components. Enjoy Long Lasting Carefree Maintenance, Too! Stamped concrete will mimic many other surfaces. It offers the advantage of durability. For example, if you purchase a brick or stone walkway, you’ll need to hire a mason to re-apply mortar at intervals in order to keep this improvement in a safe, usable condition. Since stamping concrete produces the impression of masonry without actually requiring the use of grouting materials, a stamped concrete walk by contrast typically remains functional without extensive annual repairs. Choosing stamped concrete as a building material facilitates carefree property ownership in the Greater Raleigh Area. Unlike many other building materials, concrete resists the impacts of rain and beating sun very well. It will retain its beauty and vivid colors for decades. 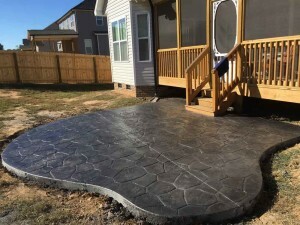 (To protect a new stamped concrete surface from weathering, some property owners find it useful to request the application of protective sealants. Ask We Do Concrete Cheap to perform this work.) You really won’t find a more versatile, easily maintained construction choice than stamped concrete! One other reason convinces real estate owners to select concrete stamping when designing outdoor improvements. If you ever decide to change the appearance of your real estate, you’ll have the option of asking We Do Concrete Cheap to simply resurface walks, drives, and patios using other available stamped concrete selections. Renovating an outdated home exterior becomes incredibly easy when you’ve made the decision to build landscaping improvements using concrete! For example, stamped surfaces provide great substrates for laying down a fresh layer of new concrete. If you’d like to change the textural properties of an existing concrete feature, you enjoy an enormous variety of available stamped concrete resurfacing selections. Refurbish a walk or a patio in a new style using stamped concrete to give your property a trendy, affordable face lift. The ease of transforming the ambiance of residential exteriors makes this construction option an exceedingly smart landscaping choice. Have you considered asking We Do Concrete Cheap to help create lovely landscaping improvements to enhance your real estate this year? We provide superb custom concrete work across the Greater Raleigh, North Carolina Area. Request our help installing walkways, driveways, porches, patios, pool areas, and other attractive outdoor features. We excel in creating lovely stamped customized concrete improvements for customers. Contact us using the website form or by calling 919-454-3927 now to schedule a personal consultation. We think you’ll love the great variety of stamped concrete outdoor décor options available for your home today!